The stamps was available from all Post Office® branches from 21st April 2011, Her Majesty The Queen's birthday. 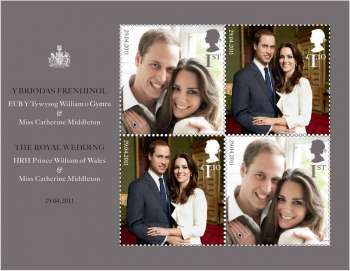 The stamps feature the official engagement portraits taken by world-renowned photographer Mario Testino on 25th November. The formal image was taken in the Council Chamber of St James's Palace, while the informal image shows the couple in the Palace's Cornwall room. As with all Royal Mail's commemorative stamps, The Queen has given final approval for their issue, with Prince William also involved in the approval of these stamps. The commemorative stamps are the first to mark the wedding of one of the sovereign's grandchildren. Stephen Agar from Royal Mail said: "We are honoured to be celebrating this very special and historic occasion. We believe that that this set of stamps will be very popular with people both in the UK and around the world." This is the third time Prince William has appeared on a Royal Mail stamp. The Prince featured on a sheet of stamps to celebrate HM Queen Elizabeth The Queen Mother's 100th birthday on 4th August 2000. In 2003, The Prince became the first member of the Royal Family to have a set of stamps produced to celebrate their 21st birthday. The Prince's wedding stamps will deliver another landmark as Prince William is the first of The Queen's grandchildren to have their wedding commemorated on a set of stamps. The last issue of stamps featuring the Royal family was brought out to commemorate the The Queen's Diamond Wedding Anniversary in October 2007. The stamp sheet consists of two 1st class stamps and two £1.10 stamps, which capture the couple in both formal and informal poses. His casual picture of the couple will go on a first-class stamp, with the more formal image on a £1.10 stamp. Miniature 115 x 89 mm. At the date of release, 1st class mail cost 60p.